Former My Chemical Romance guitarist Frank Iero has a new band, The Future Violents, and they’ll release their debut album Barriers on May 31 via UNFD. The album was recorded and mixed by Steve Albini, and the first single is “Young and Doomed,” which sounds a bit like the mid-2000s alt-rock-leaning emo of Taking Back Sunday (who Frank is opening for on tour this spring). The song comes with a video directed by Steve Pedulla of Thursday. 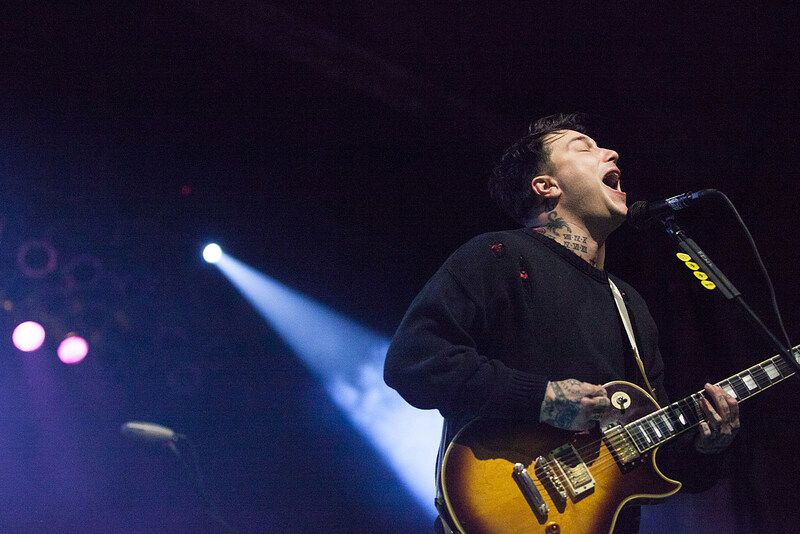 Frank also plays Warped Tour 25 in Atlantic City, day one of Long Island’s Great South Bay Music Fest (with Taking Back Sunday, Glassjaw, and The Menzingers), and he has several headlining shows including a Rocks Off Cruise in NYC on June 22. All dates here. Funky, krautrock-loving UK group Fujiya & Miyagi will release new album Flashback on May 31. You can check out the title track, which makes nice use of some dubsteppy bass, below. The group will be heading to the States for a few shows this summer, playing DC, Brooklyn (Elsewhere Hall on 7/19), Boston and Philly. All dates are here. Alt-country-ish indie rockers Gun Outfit are touring with Steve Gunn in April/May, and they added a headlining Brooklyn show happening at Union Pool on May 5 right afterwards. All dates and a stream of their latest album (2017’s Out of Range) at Bandcamp. Death metal vets Deicide are playing Maryland Deathfest this year, and they just announced that they’ll be on an all-death metal tour with Origin, Jungle Rot, and the Absence around then. All dates (including NYC’s Gramercy Theatre on 6/1) here. Legendary blues guitarist/singer Buddy Guy is on tour as we speak and he’ll be very busy on the road this year, with several more dates scheduled through August including two nights at NYC’s Sony Hall (June 26 & 27), one night at LA’s Hollywood Bowl (August 7), three NJ shows, Long Island, New Orleans Jazz Fest, Nashville’s Ryman Auditorium, and much more. All dates and tickets here. Lover of blues, hater of shoes, Mike Donovan (Sic Alps, Peacers) will release a new solo album via Drag City in late May, but before that will head out on a short tour with Surface to Air Missive, hitting Nashville, Louisville, Indianapolis, Chicago, Columbus and finally Brooklyn at Alphaville on May 3. Head here for details and dates. UK rapper slowthai is following an impressive run of EPs and singles with his debut album Nothing Great About Britain this year on Method Records/True Panther, and he’s got several tour dates coming up. Most are in the UK and Europe (including Primavera Sound, Glastonbury, Parklife, and more), but he also has US shows at LA’s Echo on 6/19 and NYC’s Elsewhere Zone One on 6/21. All dates here. It’s taken them 14 years but Calexico and Iron & Wine are finally putting out a new record together, and they’ll tour it too. Nashville singer-songwriter Langhorne Slim will be on tour this spring, with dates in Brooklyn, Knoxville, Boulder, Vail, and more. The Brooklyn show is pretty special, dubbed “Sound Mind: A Mental Health Benefit Concert” the concert also features Torres, Rosie Carney, Aparna Nancherla, and Rage Almighty. Ticket proceeds go to the National Alliance on Mental Illness of New York City. All Langhorne Slim dates are here. Illinois-based Americana project Ohtis will release their debut LP Curve of Earth next week via Full TIme Hobby and you can check out new single “Runnin'” below. Ohtis has also expanded his 2019 tour with stops in L.A., San Francisco, Portland, Vancouver, Seattle, St. Paul, Chicago, Cleveland, and Brooklyn’s Union Pool on April 23 (tickets). All dates are listed here. Bruce Hornsby — whose upcoming album features Bon Iver’s Justin Vernon, yMusic, Brad Cook, S. Carey, The Staves, Blake Mills, and more — is going on tour, including two nights at Williamsburg’s National Sawdust. Budos Band have shared another song off their upcoming album V (due 4/12 via Daptone). “Veil of Shadows” combines brooding psych-rock guitar and organ with triumphant Latin jazz horns, and it’s a combination that Budos Band pull of masterfully. They’ve also revealed that Menahan Street Band, Holy Hive, and special guests will join them at the upcoming NYC shows on their previously announced tour. All dates and tickets here.